SEOUL, South Korea -- Seoul said on Monday that the rival Koreas had begun removing mines and other explosives at two sites inside their heavily armed border as part of their recent tension-reduction steps. They will likely end up pulling out a very small portion of an estimated 2 million mines littered inside and near the 155-mile-long, 2.5-mile-wide Demilitarized Zone. But it would be the two countries' first joint demining work in more than a decade and comes amid international diplomacy aimed at ridding North Korea of its nuclear weapons. U.S. Secretary of State Mike Pompeo is expected to hold a new round of direct talks with his North Korean counterparts soon, and he's kept the prospect of a declaration officially ending the Korean War on the table. N. Korea says "no way" it will drop nukes if it can't trust U.S. The mine removal starting Monday took place at the Koreas' Joint Security Area in their shared border village of Panmunjom and another front-line area where the two countries plan their first joint searches for the remains of soldiers killed during the 1950-53 Korean War. Panmunjom, where an armistice was signed in 1953 to end hostilities in the war, is the most famous DMZ site. Rival soldiers face each other only feet away from each other, and it has been the scene of bloodshed and violence, including the 1976 ax-killing of two American troops. But it's also a venue for talks such as two of the three inter-Korean summit meetings so far this year, and its mystique makes it a popular tourist destination. Under deals signed by their defense chiefs on the sidelines of a September summit between North Korean leader Kim Jong Un and South Korean President Moon Jae-in, the demining of the Joint Security Area is part of a broader step to "disarm" the zone and turn it to a "place for peace and unity." The other area being demined is around the so-called "Arrow Head Hill," where some of the war's heaviest fighting took place over a strategically important hilltop position. Seoul's Defense Ministry said the remains of about 300 South Korean, French and U.S. soldiers are believed to be in the area. The remains of a large number of Chinese and North Korean soldiers are also likely there. During the war, an outnumbered French battalion belonging to the American-led U.N. Command repelled a series of Chinese attacks in the area in October 1952, months before a South Korean army division also turned back similar Chinese assaults. Experts believe the South Korean and U.S. militaries have planted about 1-1.2 million mines south of the DMZ while North Korea has put about 800,000-1 million mines on its side. It's not known how many mines are at Panmunjom and Arrow Head Hill, but military commentator Lee Illwoo said the Koreas would be able to clear tens of thousands at most. Experts believe both Koreas poorly managed their mines and don't know exactly how many they planted and in what specific places. It's not unusual for wooden North Korean mine boxes to wash down a swollen river in summer, causing deadly incidents in South Korea. A 2015 DMZ mine explosion blamed on North Korea that maimed two South Korean soldiers pushed the rivals to the brink of an armed conflict. Many South Korean mines are also believed to have been dislodged due to flooding or landslides. At Panmunjom, the Koreas are to spend 20 days clearing mines before withdrawing troops, weapons and guard posts in the area over the next five days. They eventually plan to have 35 unarmed personnel from each side guard the village and let tourists freely cross ankle-high concrete slabs that mark the border there. In the case of Arrow Head Hill, they aim to remove the mines by the end of November. After building a cross-border road and forming a joint excavation team, the Koreas are to launch a seven-month effort to locate remains in April next year. Monday's mine clearing is the first of its kind since the Koreas worked together to remove mines and explosives at a few border areas to accommodate now-stalled economic and transportation projects during a previous era of rapprochement in the 2000s. Other deals reached by the defense chiefs include withdrawing front-line guard posts and establishing buffer zones along the land, sea and aerial boundaries where live-fire drills and military flights would be banned. "It's the start of peace," said Kim Ki-ho, head of the private Korea Mine Clearance Research Institute. "We have to remove those mines, though we are not taking out all the mines at the DMZ." Lee, the commentator, played down the significance of the mine removal, saying that "North Korea's military threats won't disappear even though we get rid of a small number of front-line mines." The complete removal of all the DMZ mines could be a dilemma for both Koreas. South Korea would find itself more vulnerable to North Korean infiltration and assault via land routes, while North Korea would worry about front-line soldiers and residents escaping to the South more easily, Lee said. Most North Korean refugees living in the South have fled via the less guarded border with China. 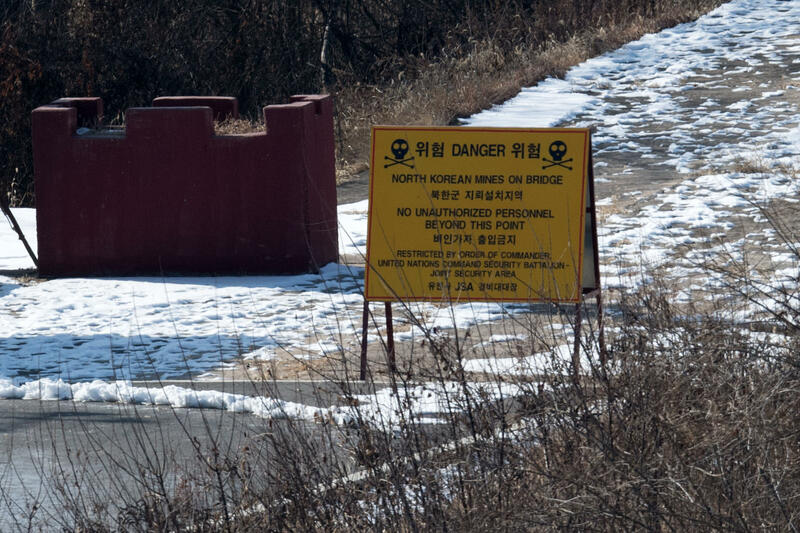 In recent years, South Korea has unilaterally removed thousands of mines annually near the DMZ as part of efforts to improve the lives and safety of civilians near the border area. Seoul's Defense Ministry told lawmakers in 2015 that at that rate, it would take about 200 years to remove all the mines on the southern side of the DMZ and nearby front-line areas. If the demining effort is sustained and successful, it would be seen as progress in the international campaign to ban mines, said Kim Jae-yeop, a professor of defense strategy at South Korea's Hannam University. The United States and South Korea are among the highest-profile countries that have refused to sign the Ottawa Convention banning the use of mines in war, which came into effect in 1999, chiefly because mines are heavily used in the DMZ.